Recently re-released in HTML5, Koi Princess is a pokie that should not be underestimated. It has an anime style main character and a seemingly familiar Eastern theme but don’t for a second think this pokie is average. This 96.23% RTP pokie from NetEnt is filled to the brim with features that will have any pokie fan laughing. From randomly triggered features to free spins and more. It makes use of a standard 5×3 reel design with 20 paylines and a very high 200 maximum wager amount but that is where the basic elements end. The reels are played against a beautiful watercolour background with the Koi Princess in all her anime glory joining you on the left hand side of the reels, cheering you on. 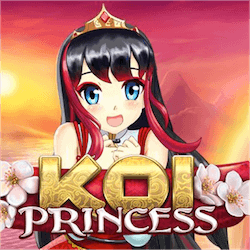 NetEnt are talented developers and with Koi Princess they have outdone themselves. It is interesting to see that they have made use of the Bonus Bet feature here. This basically means if you double your staked wager on each spin, then you can increase the odds of activating random features and it will increase the odds of hitting the standard bonus features as well as it will also increase the values on the Bonus Wheel feature as well as increasing the wins in the Sure Win Free Spins feature. 5 Hit Feature – This random feature give the player one re-spin that is guaranteed to have a 5 symbol win as part of it. Random Wild Feature – This feature gives the player a re-spin with 4 to 9 wild icons added to the reels for more winning potential. Wild Reels Feature – This feature gives you one free spins with 2 to 5 reels randomly turned wild. Bonus Activation Feature – This feature gives players 1 free spin with 3 bonus symbols present on the reels. The Sure Win Free Spins Feature – These feature awards players 10 free spins with at least one spin a guaranteed to be a winning spin. The Wild Reel Free Spins – This feature also awards 10 free spins but the player will also receive up to 5 random wild reels during these spins. The Bonus Wheel – This feature is linked to all the other bonus features. Players roll a dice and progress around the special wheel picking up free spins and multipliers.